James Stuhlman, 51, of the Overbrook section of Philadelphia, was walking his dog last week when he was allegedly killed by three teenagers in a totally senseless murder. They were going to rob him. One of them had a gun. “Please don’t shoot me,” he begged. One of the boys allegedly shot him. Then they ran away, without taking anything. All three suspects are now in custody. Philadelphia 15-year-olds murdered married father in failed robbery: cops, on NYDailynews.com. 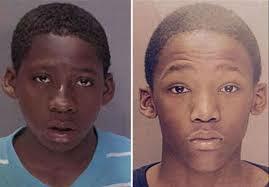 Alleged teenage gunman in Overbrook murder surrenders, on 6abc.com. Something human is missing in them. I can see it in their empty eyes. Perhaps it is not just genetic but caused by never being loved…Welfare children neglected as infants and raised on the streets. Sad but terrifying.